Since first catching a glimpse of the trailers for Draft Day a few months back I pretty much dismissed it as the least in a line of attempts by Kevin Costner this year to prove he still had the ability to anchor a film. While he's made a notable contribution in what many would agree were the best moments in last summers Man of Steel he has since not been able to really anchor a box office success where he was closer to the forefront of the action and the marketing. It is unlikely we will see another incarnation of Chris Pine's Jack Ryan where Costner served as a strong crutch and Three Days to Kill was more or less Costner trying to prove he could be Liam Neeson if people wanted him to be and while that flick likely turned a better profit than it will ever receive credit for (and has still yet to open overseas) audiences still seemed to be on shaky ground as to whether Costner is still that "face on the poster" kind of star that could usher a film into general audience favor and while the outcome of Draft Day's box office run will likely be mediocore at best it is at least reassuring to know that this is the better of Costner's two leading roles this year and that there is some real investment here not only because it serves to function as one big commercial for the NFL but because there is genuine drama to be had in the dynamics of a teams general manager and every other point of contact that is to be made throughout the course of what is no doubt the busiest day of these guys year. 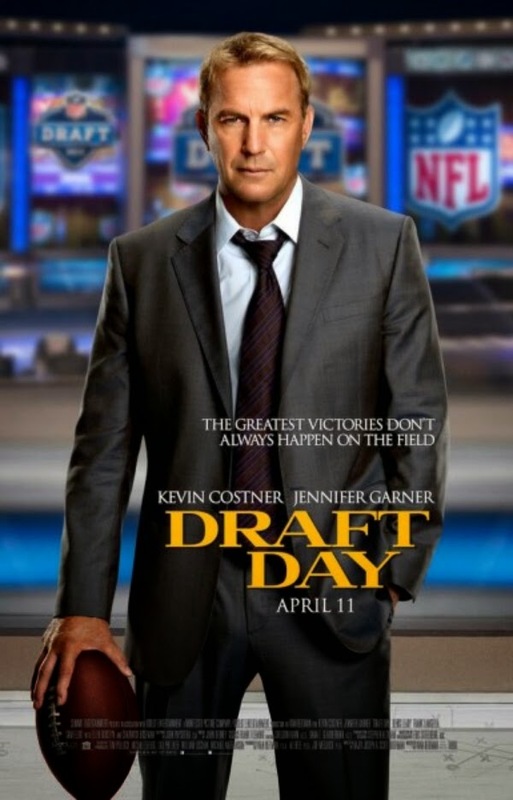 As its title would suggest, Draft Day takes place over the course of twenty-four hours and in that seemingly short time span writers Rajiv Joseph (a short list of TV credits) and Scott Rothman (no previous writing credits at all) are able to evoke a multitude of storylines and layers within those stories to give us a game of politics with a backdrop most of the movie-going public is at least vaguely familiar with. It mostly goes without saying I didn't expect much from Draft Day, but as the film nicely paces itself and builds up to its final scene I became increasingly intrigued in the outcome of these characters lives and couldn't help but to wonder how Costner's Sonny Weaver Jr. might find a way to please everyone and despite the fact the bow is tied a little too neatly in the end I would be lying if I said Sonny and his movie didn't satisfy me and instead actually exceeded any expectations I might have held for it. Sonny (Kevin Costner) and Ali (Jennifer Garner) have an interesting relationship with one another and with football. We meet Sonny the morning of the draft, his backstory being quietly filled in by ESPN's constant panel of analysts who tell us Sonny's father passed away just the week before and who was a more favored Cleveland Browns legend than his son who came to town to manage the team and fired his own father who'd long been the head coach. We don't immediately understand why Sonny chose the course he did, but what we do learn immediately is that Sonny has engaged in a not-so-public relationship with Ali (Jennifer Garner) who manages the budget for the Browns and a football loyalist her entire life. We are hit early with the news the two are expecting a child despite the fact Costner is seventeen years Garner's senior and old enough to be a grandpa himself (and the reason we find it awkwardly hilarious when Costner delivers this news to his own mother played by Ellen Burstyn who will be eighty-two this year), but this is the least of Sonny's concerns (I know how bad that sounds, but so does he) as he is dealing with the owner of the team, Anthony Molina (Frank Langella), breathing down his neck to make something happen this year and threatening to fire him if he doesn't. With that in mind Sonny is intrigued when the GM of the Seattle Seahwaks gives him a call and offers up a trade that would give the Browns the first pick of the draft and the shot at a hot new quarterback from Wisconsin, Bo Callahan (Josh Pence), that everyone is in a tizzy about. The problem being, the Browns don't really need a new quarterback as their current QB Brian Drew (Tom Welling) has been training like crazy in the off-season and is in the best shape of his life. The new Browns head coach (Denis Leary) wants a running back and has his eyes set on Ray Jennings (Arian Foster) who is Cleveland royalty after his father Earl (Terry Crews) became a star player for the team. Above all of this though, Sonny has his eyes set on a defensive player with real character, Vontae Mack (Chadwick Boseman), who he could take no problem in the first round with his number seven pick, but wouldn't be the kind of choice that would stand out or that Coach Penn feels he could build a team behind. Strapped with all of this on top of the fact his mother and ex-wife are keen on spreading his late fathers ashes on this day of football primetime Sonny is forced to juggle it all and come out on top while making it look easy. Like I said before, I expected a sports movie in line with something akin to The Blind Side rather than that of Moneyball, but what we received, while as nicely polished as can be and with the full backing of the NFL so as to guarantee no harsh words were spoken of their process or politics, what we end up with here is a kind of inside look at the booming corporation and massive machine that the NFL truly is. It is a business that isn't looked at as this kind of money-hungry conglomerate of sports, merchandising and manufactured community but instead as a pastime for us regular folks to crowd around, to share a common bond and to get all wound up about in order to give us a bigger purpose, a bigger sense of connection. That is all well and good, but in getting this peek behind the curtain I can only imagine it is eye-opening for those who simply looked at football as a form of escapism. All of this aside, director Ivan Reitman (Ghostbusters), who hasn't had the best run as a filmmaker as of late, shows he is in at least fine enough form here to dive into the strategy of the different needs for different teams and how this plays into every deal that is made and how these people who are hired to put together a team whose one goal is to win end up being these master strategists in maneuvering around the obstacles that other teams lay in front of them as much off the field as on in hopes of preventing them from obtaining the right parts to make their engine run as smoothly as possible. Reitman and his screenwriters are sure to put an emphasis on the fact character is just as big a factor in choosing a player as their talent and this indeed comes down to being the deciding factor in what Sonny decides though it doesn't make a clear distinction on whether Sonny was simply going with his gut because he had solid enough reason to do so or if he was simply looking too hard for a reason and settled for what he could justify his decision with because his gut was simply too strong to ignore. This and the fact the film tries way too hard to push the personal side of Sonny's life on the audience make the more interesting, more dynamite conversations about trading, about what will be best for the future of the team and about putting together his own team to suffer. The film feels brisk and it never gave me reason to feel bored or that it was lacking, but the burden of his fathers death was enough to place on Sonny's head and there was no reason to place Garner's Ali as a love interest, much less the future mother of his child. If they'd simply played up a fun, trusting working relationship between the two I would have taken it with much more joy and even credibility instead of a forced romantic angle. 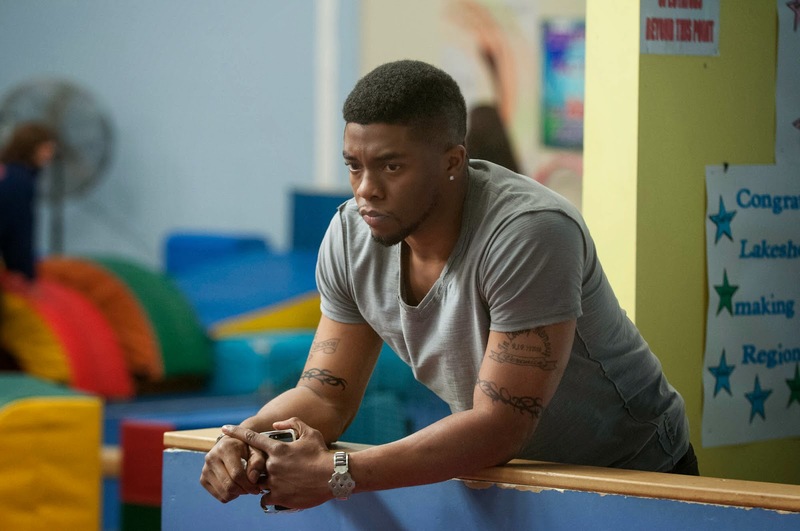 Vontae Mack (Chadwick Boseman) is hard-pressed to be an early pick in the NFL draft. What really elevates this material from being pure melodrama disguised as gritty drama with the manliest sport in the world as its cloak is the caliber of cast Reitman has attracted. Costner plays Sonny as a man, who in the beginning, isn't even sure himself of what he really wants. He thinks he knows and he keeps his values and instinct close at hand, but at the same time seems to be waiting to see if what he's truly looking for hasn't shown up yet and that he is almost hoping to be surprised by what might come forward throughout the course of this crucial day. It is in the last twenty or so minutes that Costner turns up his typically reserved demeanor into something of an electric charm, a swagger even that is contagious, and delivers one of those moments that doesn't exactly hit the level of brilliance the trade scene in Moneyball does, but comes close enough to warrant Draft Day a winner. The rest of this cast is literally just sprinkled with wonderful character actors and is a joy to behold as not only does Garner continue to do nice supporting work as she did in Dallas Buyers Club last fall, but she's taking these roles who could essentially be played by anyone and is giving them a distinct flair of a strong independent woman in a world predominantly run by men. It would have been even better did the writers not feel the need to shoehorn in that love story, but it's there and because of it we get Sonny and the rest of his "war room" buddies constantly harassing Ali for direction on where to go and what to do which only makes us feel sorry for her having to deal with these pestering, needy men all day. Where the likes of Patrick St. Esprit, Chi McBride, David Ramsey, Wade Williams, Wallace Langham, Brad William Henke and even Sam Elliot show up in these cameo roles it is the more present supporting cast of players, especially Boseman and Welling, who bring the reality of what these players are truly dealing with on this single day to the immediate light of the audience. Welling has little to work with, but in his key scene we see the desperation and need of a man worth investing a second shot in and Boseman, who is quickly becoming one of the most respectable African-American actors working today, continues to show his exceptional skill even in these smaller roles. He makes his presence known and carves out a fully realized character in less than a handful of scenes leaving us rooting for him in a way the script needs us to do but that would have easily been absent in the hands of a lesser actor. Draft Day may not be an excellent film or even a great sports movie, but it's very good and at the very least, an extremely entertaining one.